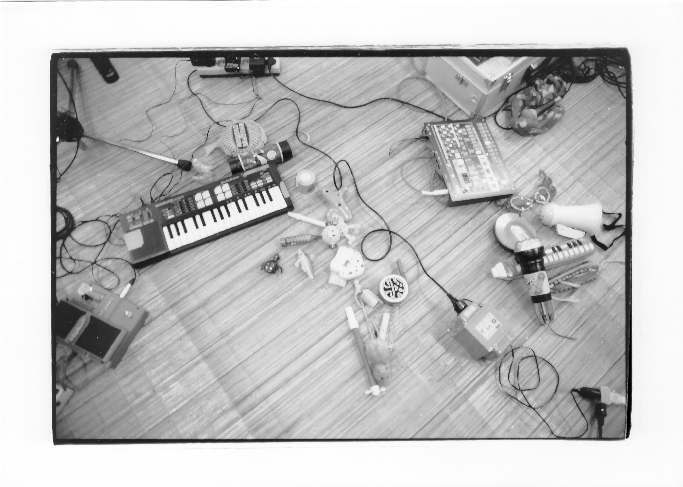 The Crappy Mini Band saw its first light in June 2007,Brussels, where a joke of making music out of toys, became serious work. The idea that music can be made by anything and the playful character that toys inhibit in their nature, provided very funny, but also technical challenging (not to mention head-breaking) situations. The Crappy Mini Band stands for experimenting with sounds, objects, electronics, toys, effects and voice. In december 2007 the band made a recording session with Japanese Tuba Samurai, Daysuke Takaoka, and the first album was born in march 2008. After a ‘Big in Japan’-tour with Daysuke san, passing Tokyo, Nagoya, Kyoto, Kobe, Osaka – meeting incredible artists, having fun and great experiences, in 2009 a 2nd album was recorded. ‘Licking Forward’ is released (in january 2010) by a Brussels label (www.lamadameaveclechien.com) that allows them to continue making eclectic, free music. Latest project included live drawings by Wim Lots on an improvised soundtrack by The Crappy Mini Band. Lots of new recordings were made, and now it is waiting for the release of all that music!